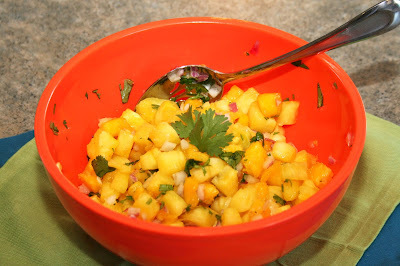 Ever since I went to Bonefish Grill earlier this year and had their Mango Salsa, I've been hooked. Although, I knew replicating their delicious sweet and spicy mix would be nearly impossible, I still wanted to attempt something similar. There's just something about a light fruity salsa atop fish or chicken; I can't place what it is, but I love it. Udi's recently came out with soft taco shells, which are probably the best I have had. They're very comparable to glutenous ones in texture and taste, and they don't break apart like most other gluten free varieties. I highly recommend these delicious shells for this recipe. These tacos are perfect for summer, especially if you grill the chicken. 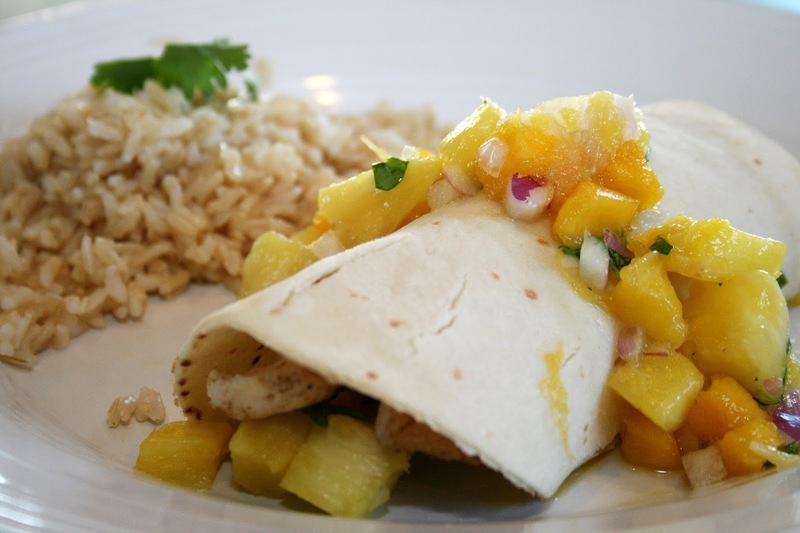 They have the wonderful grilled flavor and are topped with the fruity delightfulness of pineapple and mango. What's not to love. 1) Prepare Pico ingredients. Mix together in a medium sized bowl and refrigerate until ready to serve. 2) Heat grill. Prepare the seasoning blend by mixing the cumin and garlic salt and coat chicken strips in a medium bowl. Cook coated strips in a grill pan or basket sprayed with non-stick grilling spray, about 10 minutes, turning occasionally. 3) Warm tortilla shells in microwave and top each with chicken strips and Pico de Gallo. Can be served with sour cream, if desired. Definitely! And they have a great selection. Glutino is also very good.